New addition to company's 40 years of in-field tire protection includes Deere's 8000/8R tractors. As more producers make the switch to no-till and strip-till management tractor tires take a beating from running in field stubble, so tire protection becomes a priority. May Wes, Hutchinson, Minn., with 40 years of experience building Stalk Stompers, is adding to its lineup of the accessories and now includes the John Deere 8000/8R Series tractors in its "fit" categories. May Wes has released a version of its no-till Stalk Stompers for John Deere's 8000/8R Series tractors. 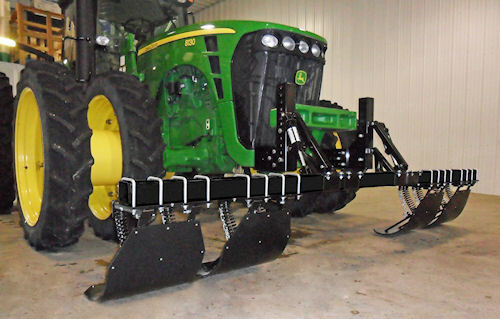 The Stalk Stomper works off existing tractor hydraulics, is robust and versatile compared with competitors, and is installed quickly and easily with no drilling or welding required. Each assembly is configurable and can be customized to fit a wide range of tractor applications, with shoes coming in multiple widths, including 9", 20", 32" and 38". For more information on the Stalk Stomper, visit www.maywes.com.